Zaha Hadid Architects, Avenues Mall Mosque, 2009, Kuwait. Rendering. © Zaha Hadid Architects. ZAHA HADID WAS MANY THINGSone of the most creative architects of her generation, a pathbreaking woman in a field still dominated by men, a formidable critic, and a beloved mentor. She was also, in her own words, a secular Iraqi Arab who had grown up as a Muslim with the religion’s ambience, rituals, and architectural manifestations around her. This assertion of identity would have been unimportant for a critical assessment of her oeuvre but for one detail: Hadid produced designs for three of the most magnificently innovative mosques of our time. These were her entry to the competition for the Grand Mosque of Strasbourg, France, in 2000; the commission for the Avenues Mall Mosque in Kuwait, 2009; and her entry to the competition for the central mosque in Pristina, Kosovo, in 2013, which has been so poorly published as to preclude visual analysis. Cerebral, flowing, and historically unassociated, the first two projects reveal a profound understanding of the meaning of Islamic rituals and a willingness to carve out new and challenging forms that capture evocative nuances of the act of prayer. In fact, they were so unapologetically avant-garde that they have remained unbuilt most probably for that reason. 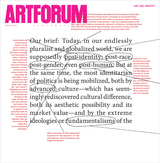 But they should be recognized for the fresh thinking they injected into an ultraconservative subfield of designone that has not been able to liberate itself from the cube-with-a-dome idiom since the codification of the Ottoman mosque typology by the great architect Sinan at the end of the sixteenth century. Hadid’s most cutting-edge design is also the first, her entry in the Strasbourg competition. Here she uses her signature fluid forms to wrap the entire complex, comprising a mosque and various spaces for a community center, but she endows them with a deep symbolism that translates Islamic sonic rituals into undulating shapes based on the visualization of the actual sound waves of the voice of the mu’adhin chanting the call to prayer. Coupled with these allusions is a metaphoric association with the curvilinear flow of Arabic calligraphy, suggested by the buildings’ fluid contours and materialized in actual calligraphic carvings inside. This reference in turn resonates with the wavy curves of the Rhine running nearby, lending the mosque a sense of place. Finally, the rippling concrete strips that define the entire complex alternate with open, glazed slits that drench the whole space inside with natural light, another powerfuland universalsymbol of the divine. 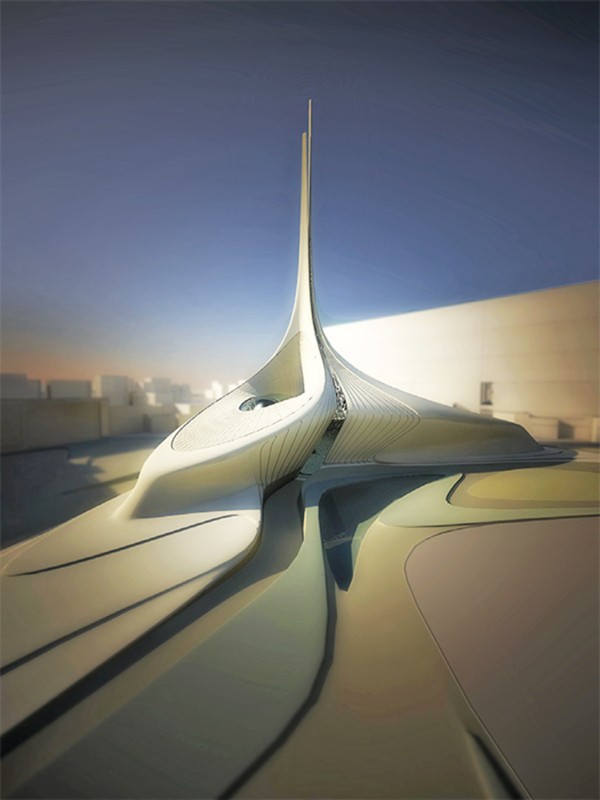 It is indicative of the conservatism entrenched in mosque design that Hadid’s lyrical submission was not selected. Instead the competition went to the postmodern Italian architect Paolo Portoghesi, whose project is but a pale rehashing of the magnificent Grand Mosque of Rome, completed in 1995. The Kuwait mosque, commissioned as part of the development of a luxury mall in the city, never moved beyond a concept design. But even at that stage, it is pure formal spirituality. Its graceful form engenders a subtle reference to the essence of Islam as an act of recognition of and submission to the omnipotence of God. Composed of three elliptical loops, each wrapping around what appears to be a courtyard and rising gently toward the center, the building’s petal-like volumes conjoin in a sinuously attenuated gesture to form three slightly diverging spires jutting toward the sky. The trio of truncated spires resembles three index fingers joined together in the sign of shahada (attestation of the oneness of God), with which the seated worshipper marks the end of the Muslim prayer. I don’t know whether the association was intentional, but the angles from which the building is depicted in published images strongly suggest it. Had Hadid lived, her growing fame would no doubt eventually have induced a future client to take the challenge and build one of her mosque designs. That would have given a much-needed boost to the recent shy experiments in breaking away from traditional Islamic architectural paradigms to explore alternative approaches to mosque design. Alas, we will have to contend with Hadid’s two revolutionary design proposals as unrealized possibilities in the ongoing search for modern prayer spaces for Muslims, a search that has become even more urgent as the very ability of Islam to adapt itself to the exigencies of our contemporary world is being so violently contested.